To create a MARC Import Remove Fields profile, go to Admin → Server Administration → MARC Import Remove Fields. Assign the Field Group a Label. This label will appear in the import interfaces. Assign an Org Unit Owner. Check the box next to Always Apply if you want Evergreen to apply this Remove Fields profile to all MARC records that are imported through the three affected interfaces. If you do not select Always Apply, staff will have the option to choose which Remove Fields profile to use when importing records. The profile that you created will now appear in the list of MARC Import Remove Fields. Click on the hyperlinked ID number. 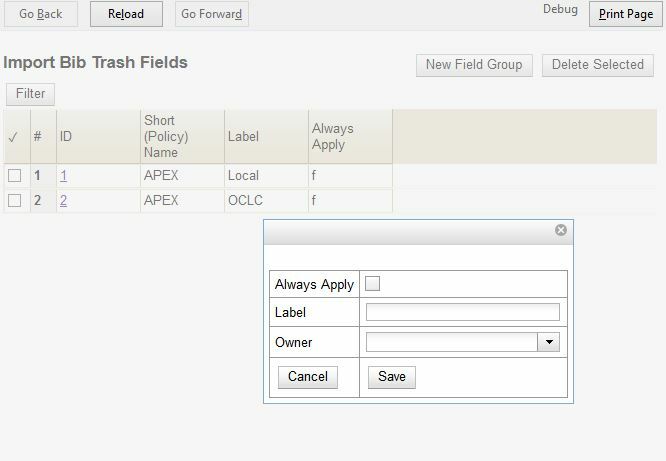 This will bring you into the Remove Fields profile to configure the MARC tags to be removed. In the Field, enter the MARC tag to be removed. Add New Fields until you have configured all the tags needed for this profile. Click Return to Groups to go back to the list of Remove Field profiles.